For the last few years, the people in the know have been wondering about the memristor. The simplest explanation of what a memristor is comes from the name itself – it’s a memory resistor. In practice it’s a little more complex, but this basic understanding is enough to convey the fact that it’s a resistor that changes its resistance based on how much current has gone through it. The memristor was first described in the 70s by [Leon Chua], the idea sat in journals for nearly forty years, and in 2008 a working memristor was created by HP Labs. Now you can buy one. Actually, you can buy eight in a 16-pin DIP package. It will, reportedly, cost $240 for the 16-pin DIP. That’s only $30 per memristor, and it’s the first time you can buy them. These memristors are based on a silver chalcogenide (Ge2Se3). When a circuit ‘writes’ to this memristor and applies a positive voltage, silver ion migrate to the chalcogenide, forming what the datasheet (PDF) calls dendrites. This lowers the resistance of the memristor. When a negative voltage is applied to the device, these dendrites are removed, the memristor is ‘erased’, and the memristor returns to a high-resistance state. This silver chalcogenide memristor is different from the titanium oxide memristors developed by HP Labs that is most frequently cited when it comes to this forgotten circuit element. This work is from [Kristy Campbell] of Boise State University. She’s been working on it for more than a decade now, with IEEE publications, conference proceedings (that one’s full text), and dozens of patents. As far as applications for memristors go, there are generally two schools of thought on that. The most interesting, in terms of current computer technology, is storage. Memristors can hold either a binary 0 or a 1 in a fraction of the space NAND Flash or old-fashioned magnetic hard drives ever will. That means greater storage density, and bigger capacity hard drives with lower power requirements. These memristors have a limit of how many times they can be cycled – ‘greater than 2000 times’ according to the datasheet. That’s nearly an order of magnitude less than MLC Flash, and something wear leveling can’t reasonably compensate for. This is a new technology, though, so that could change. The second major expected use for memristors is neural nets. Neural nets are just a series of inputs, a few neurons, outputs, and connections between all three. These connections are weighted, and the variable resistance of memristors puts them in a unique position to emulate in hardware at the most basic level what was once done with software and custom ASICs. The trade name for these memristors – Neuro-Bit – and the company name – Bio Inspired Technologies – give you a clue at what the intended use is. As with all new technologies, there’s always something that is inevitably created that was never imagined by the original designers. What these new applications are is at this point just speculation. Now that anyone can buy one of these neat new chips, it’s going to be interesting to see what can be made with these parts. That’s pretty fast, lab to a working DIP part in just a few years. Memristors will fundamentally change how a lot of our devices store long-term memory and ROM. They are also awesome for creating fast networks of pre-programmed gates. When you mix Memristors with traditional transistors and gates, you end up with something that feels like a CPLD, but is much faster and flexible when reprogrammed. Well I guess they simply mount their test chip in standard CDIP packages. Not much about this, there are plenty of companies who can do this as a service. This is not a mass production part. Two years? HP Labs made memristors back in 2008. Nantero, the IP holder is licensing the technology to existing fabs now. Nano-RAM is supposedly compatible with existing CMOS fab processes. Nano-RAM is supposedly non-volitile like existing Flash memory but with RAM read/write speeds, cost competitive with Flash, and (especially in 3D) offers much higher storage density than Flash. The one big question I have about Nano-RAM that I have not seen answered yet involves material safety: How does one safely dispose of, say, a multi-terrabyte Nano-RAM “drive” without contaminating the environment (or one’s lungs) with carbon nano-tubes? Diclaimer: I have no affiliation with Nantero. I’d guess you’d dispose of it by heating it up in air til it turns to CO2. There are plasma furnaces used especially for chemical waste disposal, all sorts of horrible dangerous things. At a ludicrously high temperature, pretty much everything breaks down to simple, stable molecules. I don’t see anything even close to resembling that claim in the datasheet. Just to be sure, I searched for the numbers “2000”, “2,000”, and “2k”, which don’t appear in it at all. And the word “greater” appears only in the context of the current required to switch it. Seriously? The best you can do is an obviously cropped image, copied to your own server, from who-knows-where? Without anything left indicating what it refers to, including whether it’s relevant at all to this manufacturer or product? Or what the footnote referenced by “***” after the stat in question says? 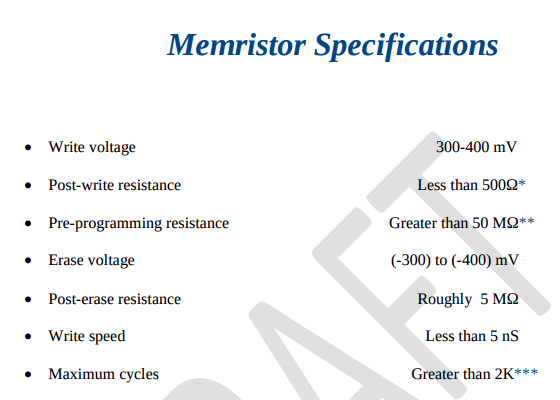 Scroll down to “Brief Neuro-Core Memristor Specifications”, champ. Then look at the 7th and final line, which unambiguously says: “Maximum cycles Greater than 10 million”. The web page and data sheet both disagree with the user manual which has draft in giant letters across the background. The >2K number came from a draft of the datasheet, so it can be outdated (and the “>” covers a lot of ground, so it’s still true). Still, the specs on write voltages are mismatched from the site and final datasheet (~0.5v on site, 1v and 4v on the datasheet) and the 1/0 resistances are all over the place on the documents, and seems to be quite dependent on the write/erase voltages and the previous resistances… I’d wait for a few iterations of those before trying to do anything with the tech, unless you are on a lab trying to improve it. The note on that line does include “Careful attention to the operating parameters can result in devices that last nearly indefinitely”. It appears that 2000 cycles is the bare minimum, and that >10M is achievable by being gentle on the cells. I’m sorry to interrupt your self-righteous rant, but that image from who knows where is actually from page 6 of the datasheet linked in the article. “2K” does exist. The line quoted is on page six. I find it really strange that it’s a DIP part. It’s cool that it’s accessible, but that website feels like it’s from the year 2000. The DIP and PLCC parts don’t help. Selenium melts at 221°C. Just a wild guess, but perhaps this part isn’t reflow friendly. Clarification: Ge3S3 is not silver-chalogenide, it’s germanium chalcogenide. Ag2Se is silver chalcogenide, sulfur and tellurium can substitute in for the selenium. Chalcogens are a whole family of compounds. It’s apparently not clear whether all devices that change their resistance according to current actually are memristors. The memristor should react linearily to current, but the real examples only work that way across a narrow range of values, or exhibit battery-like behaviour. They are. No device is ideal and memristance has been a known phenomenon for a long time that has to be accounted for in the total life of any electronic device up to an including a hunk of metal. The memristor though is specifically a device with a very large memristance function and small capacitance/inductance/non-linearity etc over an operating region. Being able to buy a practical memristor is very exciting. Unfortunately, they are already ridiculously strangled by some of the worst patents I have ever seen. Please explain how a bar of steel would have a “memristance” effect. Would it somehow “run out of electrons” at some point? High enough breakdown voltage to create metallic glass? Ion migration will move the metal, thinning and thickening it changing it’s resistance over the course of time. It can take years to be noticeable but shows up in semiconductor devices where the traces are all ready very thin. Electromigration doesn’t happen to a hunk of steel because the current density is not high enough to break the inter-atom bonds. It happens in semiconductors because you have a wire the width of a handful of atoms, where the addition or removal of an electron isn’t instantly balanced out by millions of neighboring atoms. The point of the memristors not being memristors was that the examples we have from HP etc. only approximate “memristors” over a narrow range of conditions, which is the same as saying that a circle is a straight line because the diameter is large enough for the section you’re measuring to appear so. It’s one thing to have a device that is non-ideal, e.g. a diode that also has some capacitance, some resistance, some inductance etc. than have a device that is fundamentally not but merely behaves so over some range of operating conditions. A specific comparison would be the early coherers used in AM radio transmission, where a thin tungsten needle was lowered to touch the surface of an acid solution, whereby it would form an insulating hydrogen bubble when current went one way and catalyze it back to water the other way, acting as a rectifier for the signal. The function was that of a diode, but the device is not – it merely emulates one. Same thing with the dendrite-growing electrochemical devices that emulate the function of a memristor. The 16 of them on a chip sound like R&D samples. There isn’t much use for the average hacker. It could find some interesting fringe uses. Space probes that can fully loose power but not data, OK you could achieve the same, cheaper, by using extra power to monitor your reserve and when it gets low enough to write all data to flash. But maybe memristors can handle high levels of radiation better with less heavy shielding. Doesn’t FRAM cover this scenario pretty well? Already in use in TI’s MSP430FR series. Thanks, never heard of FRAM before, interesting technology. Exactly. The concept has been around since the 70’s and never really took off, so that tells me the concept itself is flawed (or pointless), and it’s not because the technology wasn’t available to make these things. The concept didn’t take off because it took a long time until the predicted circuit element was actually found. The person mentioned in the article that “discovered” memristers actually took a look at the various terms in a circuit and said, “there should be a circuit element who’s resistance is a function of the amperage over time that has passed through it”. Xicor had a product Autostore(TM) NVRAM. It is basically SRAM shadowed by EEPROM. What is interesting is that the restore and saving is automatic based on undervoltage detection. Sounds sweet. No more loosing data when power gets interrupted. Looks like Cypress might have licensed it or bought it. It is under their nvSRAM product. Cypress calls it QuantumTrap technology (marketing speak). Some of them are not for new designs and are costly and they seem to be branching into SPI. These devices appear to use dendrite growth to create parallel paths between terminals. When current moves in the forward direction, it pushes dendrite out, creating paths and lowering resistance. When current flows in the opposite direction, the dendrites are pulled back like a collection of little resistor draw bridges. The HP devices used a thin wire with a ring of conducting TiO. The ring would slide under the field effects of current passing through and collectively thin or thicken the center of the wire by bunching up changing the resistance. If you pardon the very simplified explanations, it illustrates that not all phase change memory works on resistance and certainly not all of it works by such a direct from Maxwell’s method. Well the *really* interesting part of this is that the memristors are deliciously analog. Which means storing values *beyond* ones and zeros is a real possibility. If all the math on improving storage density is based on storing binary, what happens when someone makes a memristor that can reliably be written into 4 discrete resistances? or 8, or 16? or a billion, then starts to sound like a weighting value in a neuron. The limit is going to be the sensitivity of the circuit used to detect the level of the memristor. MLC flash is centered around an analogue device, but it’s limited to 4 levels (although, recently 3-bit “TLC” 8-level flash has appeared) because you’re dealing with some pretty small potential differences between discrete levels already. I’m going to hazard a guess that a billion discreet levels would be a bit much. What’s interesting, however, is that I would suspect it would be possible to easily achieve at least 16 levels per cell with a memristor (4 bits per cell). With flash cells, you’re effectively stuck trying to detect the charge level of a capacitor though an insulated FET gate, which is inherently difficult and prone to error/noise. Reading the voltage between two terminals of a memristor could very well be much easier. That being said, I may be wrong, given the actual values listed in the user manual. it only takes ~350mV to erase these things. At 5MΩ, that’s only 70nA of current. Still, I know there are extremely sensitive opamps out there that have bias currents measured in FEMTOamps, so…maybe that’s not too big an issue after all. One can only hope, I suppose. At that point, we’d be able to simulate qubits without the need to go down to the quantum level. Which would be a wonderful thing as far as making a FPGA that can be used as a template to build actual quantum computers that don’t need a large MRI-like device just to do read/write and computing. A multi-level memory wouldn’t be any better for simulating quantum computing than an ordinary binary memory. The thing that makes quantum computing interesting is the coupling (a.k.a. coherence) between qbits that can accelerate a few algorithms. Quantum computing isn’t generally faster than traditional computers nor do it (as so often claimed) do all the computation simultaneously before selecting the correct result. Maybe i was not clear, but what I meant was to treat it like an analogue device, not to use it as flash, but to use it as part of an artificial neuron. ISD (now Nuvoton) back in the old days stores analog signal directly in their memory cells i.e. instead of bits, they sample the analog signal. They were making voice recording chips for telephone voice mail and toys. It was the term dendrite that tipped me off – I seem to remember from biology class that’s a bit of a neuron? synapse? that looks like a tree’s roots. Dendrites describe a physical structure. Your brain has them, so do Li batteries. Lead contamination in a wafer fab will cause spontaneous dendrite growth that will ruin your wafer too. Dendrite just means “pertaining to trees”, you get dendroarchaeology, which uses dendrochronology, which is using tree rings to work out the age of things. As you probably figured out, that’s why dendrites in the brain are called that. Perhaps using a DLP chip where the mirrors are removed, or getting on micro etching, build a very small (dip chip size) carbon nanotube oven (900degC + gas) and after cooling, let grow the Sb nanowire while programming the device. Get back to me when a TB costs twice as much as spinning media. Nyle Steiner has been experimenting with these for years. No info on cycle counts, but his setup is cheap enough that networking a few hundred junctions would be quite inexpensive. The coherer detector from the early days of radio sounds like it could be considered a memristor as well. A current pulse results in decreased resistance. A pulse through an electromechanical tapper resets it to its original high resistance. Also cheap to experiment with, but not at all vibration proof so no portable applications. The coherer isn’t a memristor because the hysterestis curve is not symmetrical or linear, and it exhibits battery-like behaviour. I.e. it doesn’t behave the same for positive and negative voltages, and the tiny hydrogen bubble it forms on the tip of the needle produces a voltage when it catalyzes back into solution. It could behave somewhat like one if properly biased. I think you and I have different ideas of what a coherer is. I’m thinking of the glass tube full of silver filings, where a current pulse would micro-weld a low resistance path through the loose metal, and a physical jolt would break the welds. No battery-like behavior there. You’re thinking of some of the point contact detectors, such as the iron/mercury junction? I agree though that it’s asymmetrical. The coherer in early radios was a chemical rectifier used to cut off the other lobe of the AM signal to demodulate it. It basically did the job of a diode. A “detector” like your description was used even earlier, prior to the invention of modulation. It simply detected a carrier wave and closed an external circuit to ring a bell or a buzzer. The metal particles did not fuse together, but simply cling to each other by electrostatic forces. There was a mechanism which would automatically shake the glass tube and reset it, so you could recieve repeated pulses. Germanium atomic element (Ge) is NOT Silver (Ag). Two in.opposite directions wirh some diodes and you have a very large slow cacapacitor. I wonder how many memresistors you could create in software and still have it be real time enough to be useful. I think you and I have different ideas of what a coherer is. I’m thinking of the glass tube full of silver filings, where a current pulse would micro-weld a low resistance path through the loose metal, and a physical jolt would break the welds.